Sometimes you come across a new dish and you know it’s going to be an all-time favourite. I’m always on the lookout for new vegetable dishes – even more so since LCB course finished. We ate an awful lot of rich food during the 3 months. Vegetables did feature but not as prominently as the meat chicken and fish (mostly served with delicious creamy sauces). We practised our knife skills cutting up carrots, celery and onions for stocks, as well as turning potatoes. And we did make two aubergine and tomato dishes. And spinach and carrots in butter. But vegetables were a bit like an add-on. Chef even referred to vegetables as “garnish” which to me implies a decoration, not the 5 + a day we are told we need to keep us healthy. The vege garden is flourishing so there’s no shortage of fresh produce to play with. 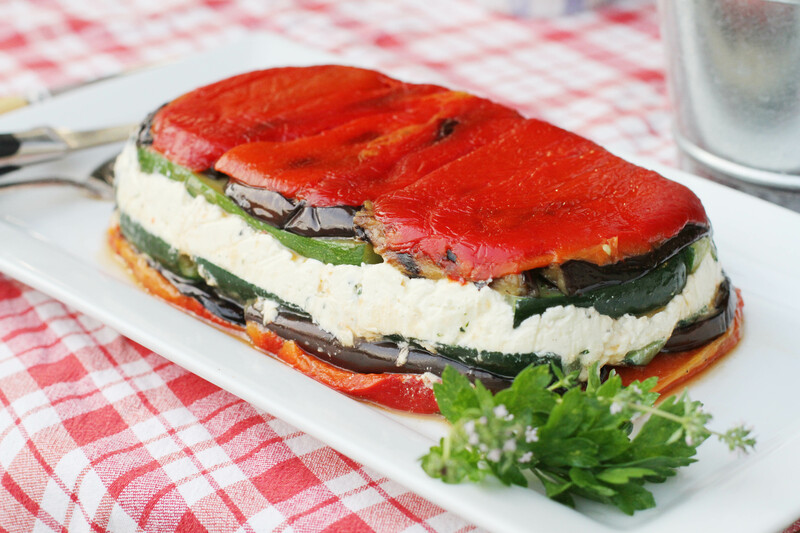 One of my favourite dishes this summer is a vegetable terrine which is very healthy (except for the layer of cream cheese and ricotta in the middle). I got the recipe off a friend who served it at a pre-Christmas buffet. I’ve since made it several times. When you’re cooking for a crowd it’s nice to have a couple of dishes prepared in advance. And this fits the bill – in fact the terrine needs several hours in the fridge to compact and chill. Line a loaf tin with gladwrap. Layer roasted peppers to completely cover the bottom. Then layer peppers with slices of char-grilled aubergine followed by blanched strips of zucchini. Mix together the cheeses garlic and basil and spread evenly across the zucchini. Layer the veges in reverse order finishing with the roasted red peppers. Fold the gladwrap over the terrine, weigh it down (I used tins of beans) and refrigerate until ready to serve. Turn out onto a plate and slice. 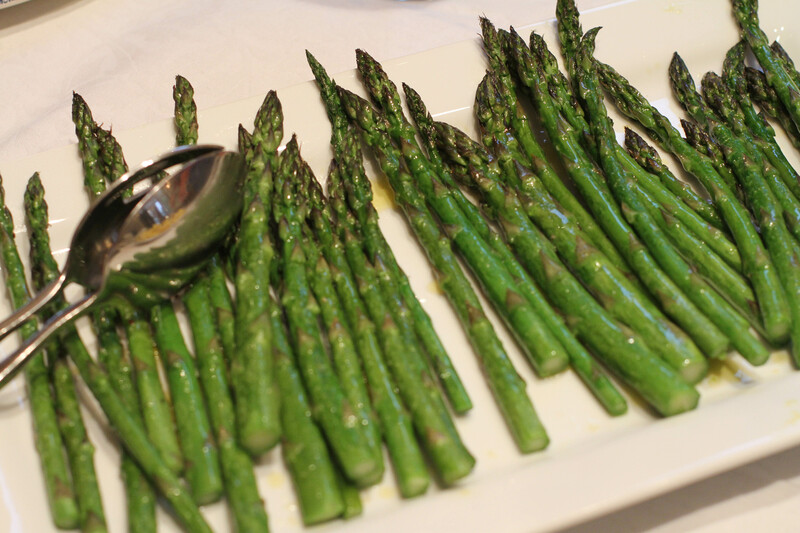 Serve with fresh crusty bread as an antipasto or with the main. If you want to add some zing, sprinkle with balsmic vinegar. My friend Elizabeth is always forwarding me recipes that are irresistible. 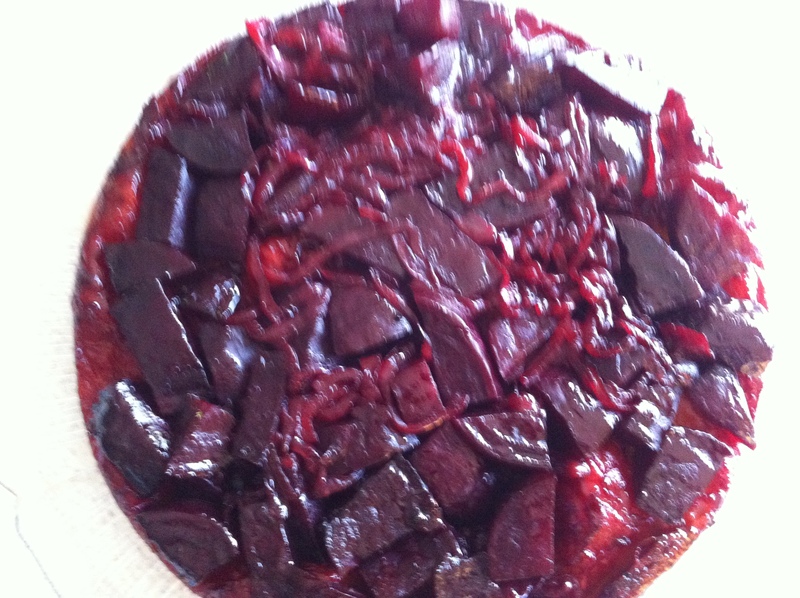 I’ve truly honed my pastry making skills thanks to LCB so when she sent me a link to Mimi Thorisson’s website and a recipe for Beetroot tarte tartin I had to make it. (I promise I will work out how to do hyperlinks this year). Heat the brown sugar in pan. When it starts to melt, add butter and stir. Add beetroot and onion and salt and pepper, and cook for 12 minutes. Add balsamic vinegar and cook for 2 minutes until reduced. Place beetroot mixture in a greased cake tin covering the entire area. Roll out pastry and cut into a round big enough to cover beetroot. Prick pastry and bake in oven for 30 minutes or until cooked. 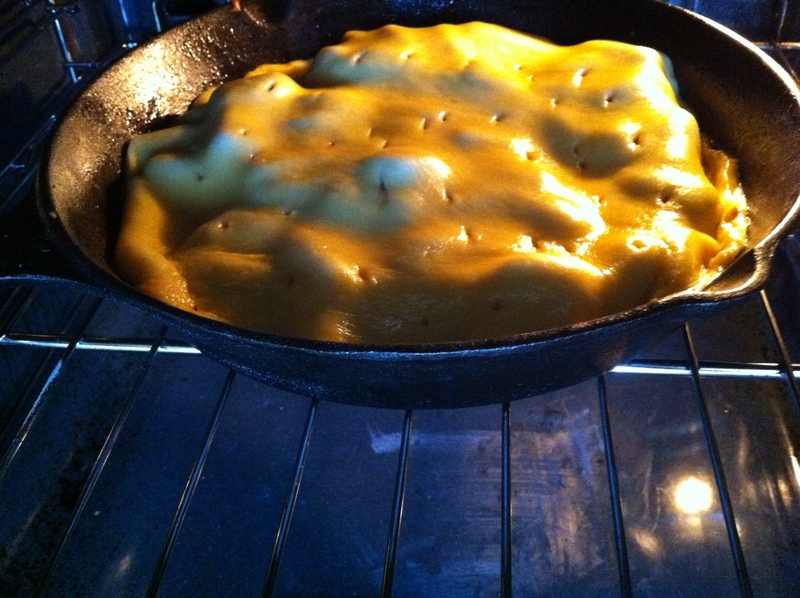 Let it cool down a little before carefully flipping out onto a serving dish. Decorate with herbs and serve with creme fraiche. The pastry theme continues with these little cuties. Goat’s cheese is an all time favourite of mine and I use any excuse to team it up with vegetables, or anything for that matter. 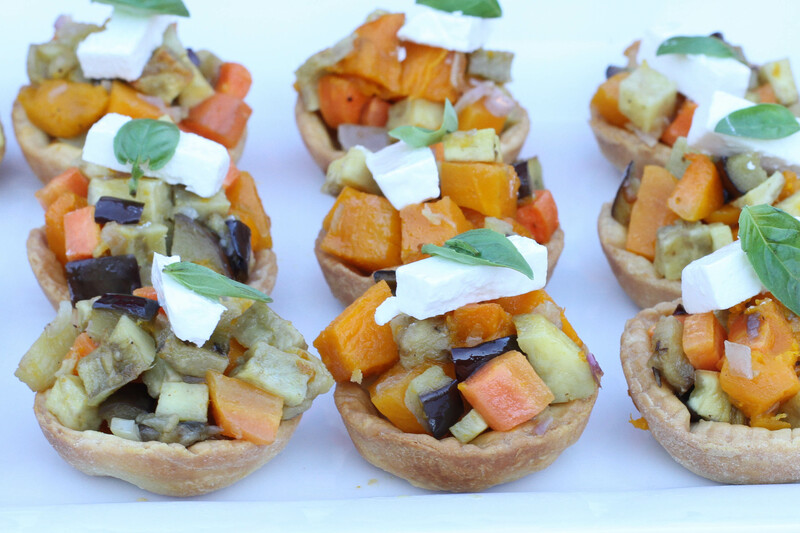 You can make everything for the tartlets in advance and then assemble just before serving. It is a bit fiddly blind baking the pastry cases but so much better than using bought cases. I get a better result using rice rather than ceramic balls to weight down the pastry. You can get right to the edge of the case. And yes, I do sometimes serve vegetables without pastry or cheese. See! « Christmas isn’t only about food…is it?